The veterans charity Combat Stress has advised staff based at one of its treatment centres in Shropshire to work elsewhere to avoid a long-running protest outside. 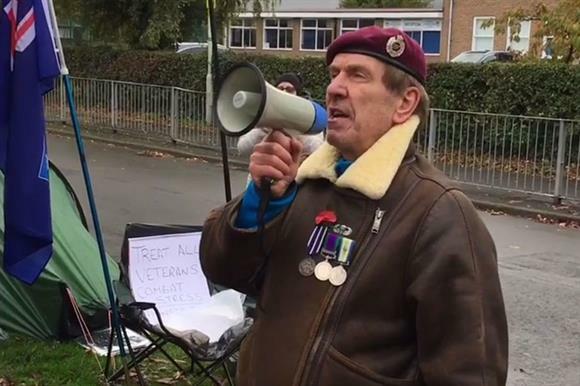 Growing numbers of protesters have been gathering outside the charity’s Audley Court offices in support of Gus Hales, a Falklands War veteran who has been protesting since August to raise awareness of mental health needs among people who have served in the military, local media reported. Hales claims he was unfairly discharged from the charity’s care three years ago, for which the charity apologised last month. Some employees had been verbally abused and threatened by people protesting outside the building, reports said. In addition, the charity said protesters had trespassed on the charity’s grounds and tried to film its work without permission. Other veterans receiving help from Combat Stress have reportedly asked for their appointments to be relocated because of the disruption. The charity told Third Sector that its duty of care to staff based at the offices was best served if they worked at other locations. It was unable to confirm how many staff work at Audley Court before publication of this story. The charity's most recent annual report, for the year to the end of March 2018, says it employs 312 staff. Its head office is in Leatherhead, Surrey. Sue Freeth, chief executive of Combat Stress, said: "We have taken the decision for our Audley Court staff to work off-site and are providing clinical services in alternative venues, some of which have kindly been provided to us free of charge, for which we are extremely grateful. We aim to resume services at Audley Court as soon as possible. "This is not ideal. We have a duty of care to both the veterans attending Audley Court and our staff. As always, we are resolved to provide the highest-quality service to all those veterans who need our help." Hales’s protest has received attention in parliament, after being raised with the defence minister Tobias Ellwood. Ellwood promised to work with Combat Stress to make sure that Hales’s "needs are looked after".